My professor told me that the pelicans looked flat. I fixed this by changing the opacity & blurring them so that they really look like they’re flying in & down from far away. The goldfish is now a much higher quality image with a magnificent pose. I changed the color of the surfboard so that it is recognizable; By doing this, the surfboard no longer looks like it is apart of the goldfish. The shark has been filtered & repositioned, & splashes have been added to it. 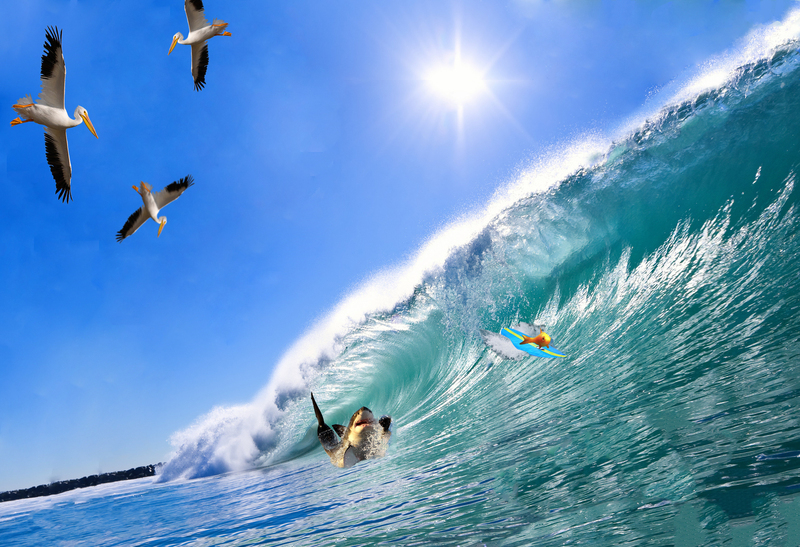 Splashes of water were also filtered with the opacity option & placed by the surfboard so that the goldfish looks like it really is riding a wave. Over-all, I enjoy the after-feedback my professor gave me earlier to fix my piece & make it look more aesthetically pleasing. My professor advised me to make the goldfish about 6 times the original size (as seen in this image) & to change the sizes of the pelicans so as to get the perspective of them correctly [that being, some being much farther away than the other]. I will do this during my free time on Monday, along with completing my Cubist rough draft & waiting on its finishing touches.